Splash pages, you gotta love 'em. A blank canvas where the artist can hit you with a large dose of illustrated 'wow'. 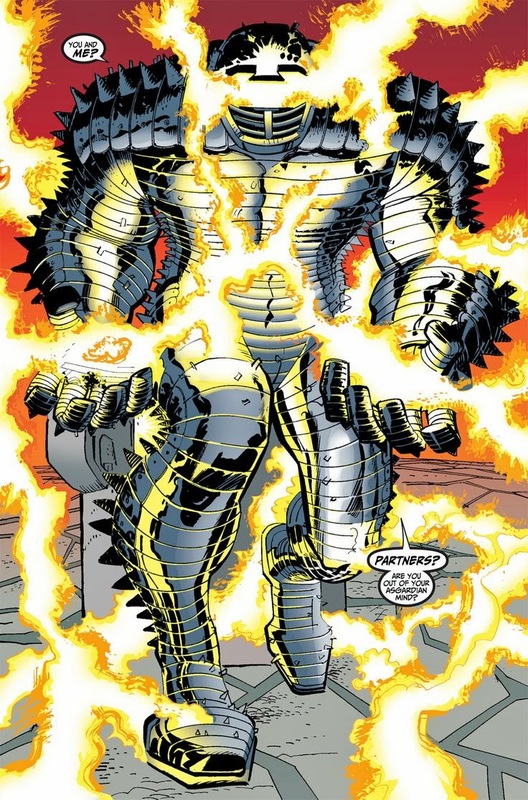 This week, I wanted to highlight a character I always feel gets left out when people look back on those John Romita Jr drew best over the course of his career; the Asgardian Destroyer. Like the Hulk, JRJr gave the Destroyer mass, weight and power, that made his somewhat simple Kirby costume, once again crackle with energy, both on and off the page. I actually think simpler costumes work more in John's favour, as other 'best renders' that spring to mind under his pen include Daredevil and Punisher. JR really is custom made to make the most out of Kirby;s designs and characters huh? I think its very interesting to see that while he's the son of the legendary John Romita, and even started drawing a bit like him in the beginning of his career, he wind up drawing more like a modern-day Jack Kirby. JRJR is one of my favorites- definitely Top 10! -Thanks for featuring him so often on your blog- I always get a kick out of seeing random bits of his work!!! Thanks guys - glad you agree! King, I honestly think he is the ONE artist I'd meet over any other, I think he's the bees knees. Superman, ain't working for me, but otherwise, his bulky characters and detail are just crazy cool. Long story short, will probably be more on the way.